Thornton & Lowe Director Tom Anderson Presents Cheque to CHAS. Home > Company News > Thornton & Lowe Director Tom Anderson Presents Cheque to CHAS. Thornton & Lowe was delighted to again sponsor the CHAS Butterfly Ball in March, and Tom Anderson, Director, recently visited Rachel House in Kinross to present a cheque for £6000.00 to the charity. Children’s Hospices Across Scotland is a vital charity providing care and support to children with life-shortening conditions, and their families, throughout Scotland. At present, CHAS is only able to help about a third of those children and families who need them, through Rachel House in Kinross and Robin House in Balloch, as well as support at home or in hospital. The Butterfly Ball, a black-tie event organised by local fundraising group Kaleidoscope for CHAS, was held at Fairmont, St Andrews, and was a great success. Over 100 guests enjoyed pre dinner drinks, and once seated were greeted by the host for the evening’s event, Dawn Anderson of Kaleidoscope. A young local singing ensemble, Cantare, opened the proceedings with three beautiful songs before a wonderful dinner was served. During dinner a Silent Auction was held and following after-dinner speeches, guests danced the night away to the sounds of the highly entertaining Scoonie Brae. 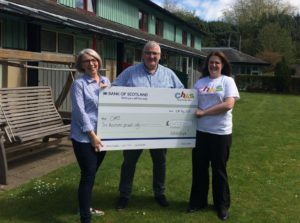 Tom is pictured above at Rachel House, with Dawn Anderson of Kaleidoscope, presenting Hannah Gell, Fundraiser at CHAS, with a cheque for £6000.00.